It's no secret that Run or Dye is the world's most colorful fun run. All around the country, Dye Runners are coming together to celebrate life, friendship, and fun in a spectacular fusion of fitness and color. 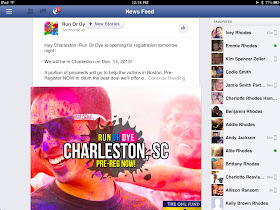 But did you know that Run or Dye has roots in ancient India? For centuries, Hindus have held a springtime celebration called Holi. Its exact origins are unknown, but it's believed to have been around since at least 300 BC. Perhaps the most memorable aspect of Holi is the Festival of Colors. During the Festival of Colors, people blast each other with powdered cornstarch dye (the same stuff we use at our races!) as a symbol of joy and goodness, and a reminder to throw worries to the wind. Not surprisingly, the Festival of Colors is extremely popular in countries with large Hindu populations, such as India, Nepal, Bangladesh, and Pakistan. But even in the United States, Hindus and non-Hindus alike come together to celebrate the Festival of Colors... (More Here including a video promotion of Holi). According to this belief, Hiranyakashipu's own son, Prahlada, was a devotee of Vishnu. 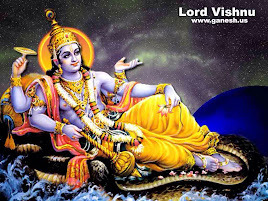 In spite of several threats from Hiranyakashipu, Prahlada continued offering prayers to Vishnu. He was poisoned by Hiranyakashipu, but the poison turned to nectar in his mouth. He was ordered to be trampled by elephants yet remained unharmed. He was put in a room with hungry, venomous snakes and survived. All of Hiranyakashipu's attempts to kill his son failed. Finally, he ordered young Prahlada to sit on a pyre in the lap of Holika, Hiranyakashipu's demoness sister, who also could not die because she had a boon preventing her from being burned by fire. Prahlada readily accepted his father's orders, and prayed to Lord Vishnu to keep him safe. When the fire started, everyone watched in amazement as Holika burnt to death, while Prahlada survived unharmed. The salvation of Prahlada and burning of Holika is celebrated as Holi. (More here from the BBC). So, before participating in any festival, no matter how fun it looks, I have once again been reminded of the importance of checking things out. As Christ followers, we should be vigilant in our understanding of what we choose to be involved in. Interestingly enough, this is supposed to be a celebration for unity in a religion that not only practices but typically celebrates division and caste systems. During this one time a year festival, the lowest caste (the untouchables) can be in the presence of the highest caste (the Brahmans) without shame or fear of repercussions. So, as I think of what we as Christ followers are called to be, I am reminded once again of the words of Jesus who told us clearly to love one another as He has loved us (John 15:9). While Holi celebrates one day a year of love for everyone, Christ followers, in distinct contrast to a caste system which divides, live a life of love that changes everything about us as well as how we daily respond to those around us. I Corinthians 13 reminds us that no matter how religious we are or how busy we are or even how much we sacrifice, if we don't love, we are wasting our lives. God is love. Everything that happens to us has to be placed against the backdrop of God's love. What does that kind of love look like? The Cross! So, next time you want to take part in something that makes you feel better about yourself, think about how much God loves you. It is because of His love that we can now love one another. That is reason to celebrate! 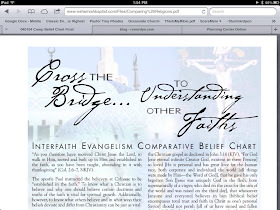 For a comparison chart of Christianity to Hinduism, feel free to look at and download this Interfaith Evangelism Comparitive Belief Chart PDF from NAMB. 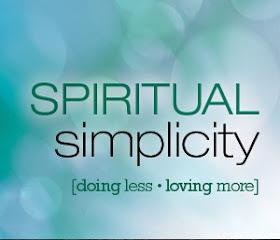 New Sermon Series - Spiritual Simplicity Every Sunday through June 2 at 10:30AM. Invite your friends, neighbors, fellow students, workmates, and family to hear these life changing messages at Mount Pleasant's best kept church secret, Oceanside. Connected people connect people! Church Online Podcast Ministry - You can listen to Oceanside's messages 24/7 on the podcast. Also, a great way to introduce your friends to Oceanside Church. Thanks to out incredible AV ministers, the message is uploaded by Sunday afternoon. Join the nearly 6000 people who have listened to Oceanside's Church Online. Exponential 2013 - Join Oceanside Church for a FREE Live Webcast from Orlando. We were just contacted and asked to simulcast Exponential 2013 for them at Oceanside Church. The webcast features 25+ national leaders including Francis Chan, Rick Warren, Craig Groeschel, Randy Frazee, Dave Rhodes, and many, many more. Come when you can and experience this incredible opportunity together. It's the second best thing to actually being in Orlando. Ever since my wife decided to get involved in the Color run I could not but notice the connections with Hinduism. Not having to time to research this till now, I greatly appreciate you putting this up. I'm thrilled for God to use my research to help. Blessings! Something about these color runs has just felt "off" since first hearing of them. Didn't know why but they seemed wrong somehow. I finally decided to google tonight and makes a lot of sense now. Nathan, that baptism comparison was fascinating! I saw you posted it on another site as well. I read something similar about that whole "ice bucket challenge" that was going around. Crazy days we are living in! Thanks for reading. Spread the Word!